Powers/Abilities: Bozo is bulletproof and possesses superhuman strength. He can operate in a number of hostile environments, including the depths of the oceans. He can run as fast as a car. He contains a hollow cavity within his body capable of fitting a full sized human, and can be piloted by his passenger. He can also be commanded by remote control. 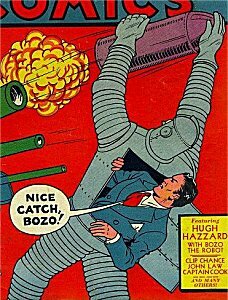 History: Bozo was a robot invented by the villainous Dr.Van Thorp, who planned to use his invention as a means for world conquest. However the scientist had reckoned without the heroic youth Hugh Hazzard, who overheard his plotting, and intervened, defeating Von Thorp and stealing Bozo. After the Doctor was arrested, Hugh continued to use Bozo to fight crime. Comments: Created by George Brenner. Bozo's adventures ran from Smash Comics #1 to #42 (April 1943). He became property of National Periodical Publications (D.C. Comics) in 1956, just like most other Quality characters, but thus far, has only been seen in cameo in Starman II#64, where he was seen to be part of a Japanese collector's hoard. 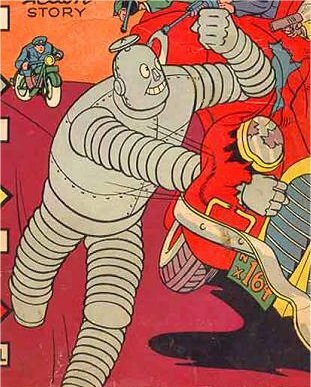 I'm not entirely sure if Bozo was capable of autonomous action (making him a robot as the title said), or if he was really just an over-sized suit of powered armour (effectively making Hugh Hazzard the real identity of Bozo). The image on the left suggests the former though, so until I find out for sure, that's what I'm sticking with.